Anil Ambani’s Reliance Group created a stir in October when it filed a slew of defamation suits against media organisations, journalists and politicians for raising questions about the Rafale deal. It was“the largest defamation blitz in recent memory in the country”. said The Telegraph. The blitz is actually bigger – and stretches beyond Rafale. Court records show that since January 2018, four Anil Ambani-owned companies have filed 28 defamation suits in Ahmadabad courts. Eight cases are against politicians from Opposition parties, while 20 cases are against media organisations and journalists. The defendants include international news outlets like Financial Times and Bloomberg, and a wide range of Indian publications like The Economic Times, The Financial Express, The Week, The Tribune, The Wire, and the news channel NDTV. Among the journalists who have been sued, independent of any media organisation, are former Financial Times reporter James Crabtree and Business Standard columnist Ajai Shukla. The politicians facing litigation include former Maharashtra chief minister Ashok Chavan and former Kerala chief minister Oommen Chandy. Scroll.in examined the court records in all 28 cases and contacted the organisations and individuals sued. Some defendants said they had received notices from the Reliance Group threatening legal action but they were not aware of court proceedings initiated against them since they had not received any summons. Other defendants said there were not given enough time to respond to the legal notices. Scroll.in has reviewed one notice that asked a media organisation to publish an unconditional apology and retraction, remove the published article, and cease and desist from publishing similar articles, all “within 24 hours of the receipt of this notice”. Reliance Group’s executive senior vice president for corporate communications and public affairs acknowledged Scroll.in’s email but did not respond to the queries. The four group companies that have filed cases in Ahmadabad are Reliance Communications, Reliance Infrastructure, Reliance Aerostructure and Reliance Naval and Engineering, which was formerly Reliance Defence. The cases go beyond the coverage of Rafale. Several of them relate to news reports on the sale of key telecom assets by Anil Ambani’s Reliance Communications to his brother Mukesh Ambani’s Reliance Jio in December 2017. Twenty six cases are civil suits in the Ahmadabad City and Civil Sessions Court, claiming damages under the Code of Civil Procedure, 1908. As an earlier Scroll.in report explained, Ahmadabad is a preferred destination for filing defamation suits because Gujarat laws cap court fees at Rs 75,000, no matter how high the value of the suit. Two cases are criminal defamation suits in the Metropolitan Magistrate Court. One is against “Ajay Shukla”, presumably the journalist Ajai Shukla, under Section 500 of the Indian Penal Code which prescribes punishment up to two years of imprisonment. The other is against “Mangalam Keshavn Venu”, presumably Mangalam Kesavan Venu, the founding editor of The Wire. The names of both the journalists also feature in civil suits against The Wire and have been correctly spelt there. Of the civil suits, the one against NDTV appears to involve the highest amount of damages claimed – Rs 10,000 crore. The Telegraph calculated that the damages claimed in 11 cases add up to Rs 65,000 crore. Scroll.in has been able to additionally confirm damages of Rs 15,500 crore in five other cases, which takes the amount of damages claimed in 16 cases to Rs 80,500 crore. The full extent of damages sought in all 27 cases is not known. Reliance Communications filed three court cases against Bloomberg News, including two that names editors and journalists from Bloomberg Quint, a joint venture with Quintillion Media. The first case was filed on January 12 against Bloomberg Quint’s national news editor Sajeet Manghat, Bloomberg News’s South Asia managing editor Arijit Ghosh, reporters Denise Wee and Bhuma Shrivastava. The second case was filed the same day against Manghat, Ghosh, Wee, Shrivastava and Bloomberg News columnist Andy Mukherjee. The third case was filed on February 16 against the company Bloomberg News, Ghosh, Shrivastava; reporters Saket Sundria, PR Sanjai, Siddharth Vikram Philip and Candice Zachariahs; directors Dara Phirozeshaw Mehta, Richard Kaltman Descherer, and alternative director Zubin Sohrab Morris. Bloomberg News declined comment on the queries sent by Scroll.in regarding the cases. However, in a report published on October 19, the news organisation said it was “defending litigation brought by Anil Ambani and Reliance Communications in connection with previous Bloomberg reporting”. A person familiar with the cases said that one of them was related to a report published on October 13, 2017, about minority shareholders in Anil Ambani’s Reliance Group. Reliance Communications filed a case against Financial Times’ Mumbai correspondent Simon Mundy, South Asia bureau chief Amy Kazmin and the company Financial Times Limited, London, on January 30. The newspaper had published several Reliance Group-related stories under Mundy’s byline, including a long feature on January 4 on how Anil Ambani faced “a humbling denouement to the Bollywood-like feud with older brother Mukesh”, after he sold off key assets of Reliance Communications to his brother’s firms. Reliance Naval and Engineering filed a case against writer and former Financial Times journalist James Crabtree on January 30. The grounds of the case are unclear. Crabtree declined comment. Days before the case was filed, on January 11, he had published an article in Nikkei Asian Review on the telecom assets deal between the two Ambani brothers which “had ended one of Asia’s longest corporate quarrels, handing Mukesh Ambani a satisfying family victory and humiliating his brother in the process”. Two cases have been filed against The Financial Express on February 16. The first case was filed by Reliance Communications and against The Indian Express Private Limited, which publishes the business daily, IE Online Media Services, publisher RC Malhotra and assistant editors Shayan Ghosh and Shobhana Subramanian. The second case was filed by Reliance Communications and Reliance Infrastructure against The Indian Express Private Limited, IE Online Media Services, publisher RC Malhotra and managing editor of Financial Express, Sunil Jain. This defamation case was filed against Sunil Jain’s column published on December 23, 2017, which critiqued the court verdict in the 2G telecom spectrum scandal and had a reference to the Anil Dhirubhai Ambani Group, another name for the Reliance Group. A person familiar with the cases said the defamation cases against the newspaper were valued at Rs 1,000 crore each, making the total damages being sought Rs 2,000 crore. Reliance Communications and Reliance Infrastructure filed a case against The Economic Times on February 16. Those named as defendants: publisher R Krishnamurthy, deputy executive editor Saubhik Chakrabarti and senior editor Suman Layak. On November 16, Layak forwarded Scroll.in’s queries on the case to the organisation’s legal team, which has not responded. The newspaper had published a long feature by Layak on January 7 on the changing fortunes of Amil Ambani’s “once sprawling business group [which] is as close to fighting for survival as it has ever been”. The Wire has three cases registered against it. The first case was filed on February 16 by Reliance Communications and Reliance Infrastructure against MK Venu, one of the three founding editors of the website, manager Radhakrishna Muralidhar and the Foundation for Independent Journalism, the non-profit that publishes the website. Seven hearings have been held in this case between March and November. The second case was filed on September 24 by Reliance Infrastructure, Reliance Defence and Reliance Aerostructure against columnist Ajai Shukla, founding editors Siddharth Varadarajan, Siddharth Bhatia and MK Venu, along with Muralidhar and the Foundation of Independent Journalism. Shukla is a columnist of the Business Standard. The third case was filed the same day by Reliance Naval and Engineering against journalist Ravi Nair, Muralidhar, Venu, Varadarajan, Foundation of Independent Journalism. Nair is an independent journalist who has written about the Rafale deal for The Wire. On November 12, The Wire’s editor Siddharth Varadarajan said the publication had “not received any information about these cases from the companies you mention, their lawyers or the courts.” His colleague MK Venu added that while the publication had received legal notices asking them to take down reports, which they had ignored, they were not aware of the cases until a researcher flagged them in mid-November. Subsequently, in a phone conversation on November 23, he said court summons had been served in one case. According to Venu, the notices threatened legal action against a report he wrote on 2G verdict and a video in which Venu, Shukla and Happymon Jacob, an associate professor at Jawaharlal Nehru University, discussed the Rafale deal. In the legal notice for the video, the Reliance Group threatened to sue The Wire for Rs 6,000 crore. Reliance Communications and Reliance Infrastructure filed a case on February 16 against publisher Jacob Mathew, editor Philip Mathew, reporter Nachiket Kelkar and research desk member Neeraj Krishnan. Scroll.in sent queries to which Jacob Mathew responded on November 16 and said that they have forwarded them to the legal team, which has not yet responded. Nachiket Kelkar’s author profile on The Week website shows three reports on Anil Ambani’s Reliance Group, including a long feature on how Reliance Communications went from being “a prize catch for Anil” to “an ailing, debt-laden albatross around his neck”. A case was filed on August 13 against The Tribune’s editor Rajesh Ramachandran and writer and former joint secretary for Government of India SN Misra. The case was filed by Reliance Infrastructure, Reliance Defence and Reliance Aerostructure. On SN Misra’s author profile, a story dated August 6 is headlined: “Heat and light of the Rafale deal”. Ramachandran did not respond to Scroll.in’s queries. Reliance Infrastructure, Reliance Defence and Reliance Aerostructure have filed two cases against National Herald. The first case was filed on August 13 against Associated Journals Limited, the publisher of the newspaper, editor-in-chief Zafar Agha and journalist Vishwa Deepak. The second case was filed on September 24 against Associated Journals Limited, Agha and journalist Bhasha Singh. A case against Mustafa, the editor of the news website The Citizen, was filed on August 14 by Reliance Infrastructure, Reliance Defence and Reliance Aerostructure. In the civil suit, which Scroll.in has reviewed, Reliance companies have claimed damages worth Rs 7,000 crore for an article written by Mustafa and published in The Citizen on July 31. Titled “The Younger Brother: A PM Modi favourite”, the article focuses on the Rafale deal, echoing allegations that the company had been favoured by the Indian government at the cost of Hindustan Aeronautics Limited. Reliance companies have accused the author of acting in a “pre-meditated manner at the behest of the Plaintiff’s rivals”. It also stated that Dassault Aviation out of “free will” chose to partner with Reliance Group and that “no undue favour” was received from the government. In her response to the civil suit, Mustafa said she had received a legal notice from the Reliance Group on August 2 and had responded to it on August 14. She denied all allegations made against her and stated that her website was “fully prepared” to publish Reliance Group’s response to it. Reliance Infrastructure filed a case against Shaikh, a journalist at DNA in Mumbai, on August 16. A person familiar with the case said a cease-and-desist notice was sent to Shaikh in August, alleging two stories he had written for the newspaper had defamed the company. One of them was published on June 29. It said Maharashtra Electricity Regulatory Commission had raised objections to the alleged non-payment of electricity duty by the company in Mumbai. The other story published on July 30 said Reliance Power stood to gain by Rs 2,000 crore if the regulatory commission approved an increase in electricity charges for Mumbai power consumers. The company has claimed damages worth Rs 500 crore for both the stories, said the person familiar with the case. 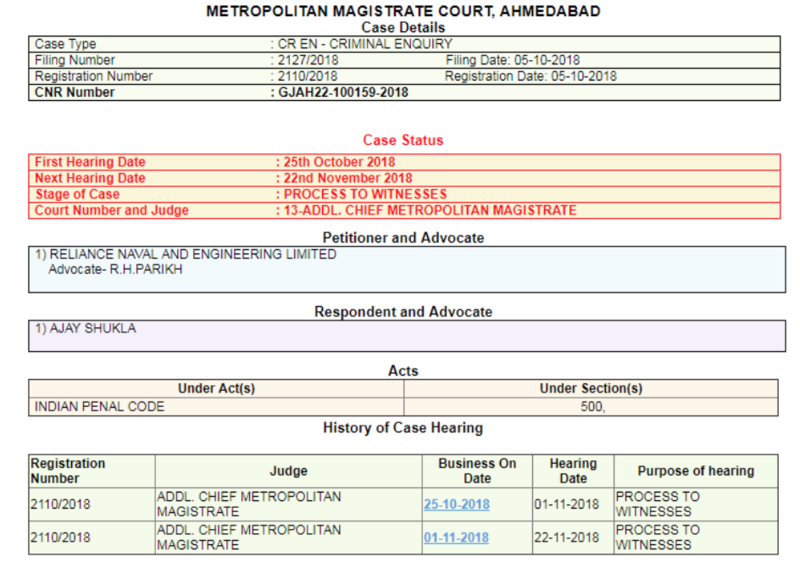 On October 5, Reliance Naval and Engineering filed a criminal application in the Metropolitan Magistrate Court in Ahmadabad against “Ajay Shukla”, presumably a misspelling of the name of the Business Standard columnist Ajai Shukla. It was filed under Section 500 of the Indian Penal Code. Shukla told Scroll.in he was not aware of this case and had not received any notice or summons. He said he found it “strange”. On October 9, Reliance Infrastructure and Reliance Defence filed a case in the Metropolitan Magistrate Court, Ahmedabad, against “Mangalam Keshavn Venu”, presumably a misspelling of the name of MK Venu, the founding editor of The Wire. The court record shows three hearings have been held in the case, resulting in adjournments. Another hearing was scheduled for November 22, but details have not yet updated. Reliance Defence, Reliance Infrastructure and Reliance Aerostructure filed a case on October 11 against NDTV Limited, founder Prannoy Roy and managing editor Sreenivasan Jain. On March 1, Reliance Infrastructure and Reliance Defence filed a civil defamation suit against Sanjay Singh, a leader of the Aam Aadmi Party who is a member of the Rajya Sabha. Scroll.in emailed queries about the case to Singh but he did not respond. He had earlier told the Press Trust of India that the Reliance Group was seeking Rs 5,000 crore as damages for his statements questioning the Rafale deal and that he “will continue to raise his voice against the scam”. Seven cases have been filed against eight politicians of the Indian National Congress. Varun Chopra, the lawyer representing the party, said “the allegations relate to specific press briefings, public agitations, Morcha in Mumbai by leaders and follow up articles in the print media”. On August 13, Reliance Defence, Reliance Infrastructure and Reliance Aerostructure filed separate cases against Chandy and Gohil. A legal notice dated August 3 accused Gohil of making “false, frivolous and baseless allegations” about the Rafale deal at a press conference held on July 28 in Delhi. It alleged they were part of a “taskforce” formed by party president Rahul Gandhi to take on the Modi government over the deal. On August 14, three more cases were filed by the Reliance companies – the first against Congress Communications chief Surjewala, the second against Chavan, former Maharashtra chief minister Chavan and Nirupam, president of Mumbai Regional Congress Committee, and the third against Singh, the head of the party’s Uttarakhand unit. Two more cases were filed by the same three Reliance companies on August 18 – one against Jakhar, the president of the Punjab Pradesh Congress Committee, and another against Chaturvedi, Congress spokesperson. These cases also pertained to press conferences held on the Rafale deal.